Alarms go off in the early morning. Zippers slide open. Backpacks rustle. Headlamps and cell phones flare to life. People move in the dark around the rows of bunk beds. One or two at a time trickle out until the beds are empty, left to wait for the next pilgrims. I pack slow, still tired from the night. I barely slept. Too many noises, too much breathing, too many sounds that did not sink into the background. The Camino climbs notoriously out of Saint Jean Pied du Port to cross to the Spanish side of the Pyrenees. People leave early, some before dawn, the weight of new backpacks on their shoulders, the fabric of new shoes rubbing soft feet. There are two routes, a high route once used by Napoleon that climbs up a ridge before dropping back to Roncevaux Pass, and a low route, used in winter, that snakes up the valley before popping over the pass to to reach the small village of Roncesvalles on the other side. “At the pilgrim’s office they said there’s a 12,000 euro fine if you go the high route,” Daya tells me. We are the last two hikers left in the albergue. I am not surprised. She just finished the Appalachian Trail a few months ago. She’s headed to the PCT in April. We both pay lip service to the idea that this climb is serious, the kind of thing you should wake up at dawn to begin, but I don’t think either of us believe it in our hearts. I know I don’t. It’s not the first climb. It is another climb. The fine saddens me. A ridge is always better than a valley. I’d hoped to get a look at the mountains, to see where the snow line was, to make my own decision about what is possible. I have a good eye for that. If I didn’t I would be long dead. Shutting down a mountain feels too sanitized, too Disney, too lowest common denominator. Fools should be allowed to be fools. So people get lost, they get injured, some even die, but the same could be said for any highway and we are far from banning cars. If nothing else, I thought I owed the Pyrenees my best efforts to not sneak over them along a paved road after we’ve spent so much time staring at each other but never really meeting. But 12,000 euros is 12,000 euros. I put on my pack and walk out into the fog of Saint Jean Pied du Port. I stop in a shop to buy a guidebook, not so much for the route directions, but for the history. When I come back out, I run into Daya on the street. We walk together until I stop at a bakery for bread. It’s still warm from the oven. I meet a Korean man named Won Gyu at the junction where the high route splits from the low. I show him how to read the secret language of trail markings as we walk together in the fog. He tells me he was staying with a religious community in France when he found a book about the Camino someone had left there. It was in Korean. I say it was a sign. He read it and decided to make the journey. The two of us catch up to Daya a few minutes later and walk until Won Gyu stops to rest. Daya and I continue on, talking about the things hikers talk about, food, trails, equipment, philosophy, and life. She stops to rest and I drift on, reading my guidebook as I walk. A man passes me. He has a serious look and barely says hello. I run into a woman with a white backpack at a confusing junction and we laugh while we figure out which way to turn. I see her again when I stop to look at the mountains, to search for snow, and check my maps. Daya catches me in a small village. We buy food in a grocery store and sit in the square to eat. I’d looked it up. 12,000 euros for anyone caught on the Napoleon route before March 31. It is an arbitrary date. There is no real snow, no real reason it should be closed. The Pyrenees stretch back in a long line, the barren, rounded tops rise to jagged, snow-clad peaks in the far distance. I walk the last few steps to the top of the mountain then turn, staring out at everything, the flat lands, the valley with Saint Jean, the chain of mountains running east to west, the smoke billowing up from a fire on the far side of a ridge, the Napoleon route in the distance, free of snow and still closed, the low route snaking somewhere in the valley below, the horizon, hazy with smoke, curving away. The whole world is there, stretched out around me. I don’t blame Daya for not coming with me. I felt I owed her the offer, since we’d talked about the high route earlier, but I felt better risking a mistake alone. The plan wasn’t perfect. It all depended on what a mile of ridgeline looked like. Something neither of us would know until we stood there. The only way to know would be to climb to the top and risk having to walk all the way down again. Leaving the Camino was almost difficult. The trail has its own kind of gravity. A woman chased me down to tell me I was walking the wrong way. Five minutes later a farmer whistled me over and pointed back down to the valley. I asked him about the road and the ridge, if I could connect it to the pass. His face softened, relaxing with each word until he knew I wasn’t just lost, that I knew exactly where I was going. “It’s very far,” he said. He got a gleam in his eyes and nodded back, stepping to the side as if he were a guard on the road and I had permission to pass. I sit on the mountain for a long time. I want the view to burn into my eyes. I stare and stare and stare. The distant valley. The sharp peaks in the distance. The fire and smoke hazing the horizon. Is this the last great view of this journey? Will I sit on another mountain before Tarifa? I don’t know the answer. The ridge is steep but passable. Smoke pours over it from the fire burning in the far valley. I tie a bandana over my face and walk through it. My eyes burn. The world disappears into a haze until I emerge on the far side. It’s the kind of wild walk I adore, a last taste, then animal trails solidify into dirt tracks, dirt tracks into gravel, and gravel into pavement. I curve around to the pass and reconnect with the Camino just as three German women reach the top. They met yesterday on the train. They already look like old friends. Trails do that, weave us together like threads in a loom. We walk, the four of us, the last few minutes to Roncesvalles, an old collegiate church that has been a refuge for pilgrims coming over the pass for hundreds of years. There are lots of us there, maybe twenty-five, Won Gyu, two other Koreans, a woman from Argentina, Daya, the three Germans, two older Americans who have done this before, a Frenchman, a Spaniard from Valencia. There are sore muscles and blisters, some wobbly strides, dirt on nce-new fabric, but we’re all happy. The priest, father Valentine, stops by to offer a tour to any who would like to join him. A group of us crowd around as this gentle man leads us through the maze of buildings, the cloister with its square walkway that allowed monks to walk in quiet contemplation around and around for as long as they needed, the giant hall with a king’s tomb, the church copied from the style of Notre Dame that brought gothic arches to Spain for the first time. Different centuries roll off his tongue as he points to the worked stone, 12th, 16th, 13th. He explains symbols and signs, the blended shepherd staff, cross, and spade that represents Roncesvalles, the chains and emerald in the crest of Navarre. He shows us the old church’s clock, the organ pipes, and the silver plated Virgin Mary high on the alter. He talks of kings and armies and the wars fought against the Moors. As he talks, magic weaves between our group, strangers become friends, laughing together, learning together, translating words between five languages, some of us religious, some not, but all together, connected by this trail, woven in the loom. I am the last to leave when the tour ends. Father Valentine shakes my hand, his free hand reaching up to squeeze my shoulder like I’m an old friend as he wishes me a good night. I wonder how many pilgrims he must meet, thousands every year, and yet he made each of us feel at home, each of us feel like we were special to him. I walk back to the dormitory. The night air is cool. I think of the mountain top and how beautiful it was, how the whole world seemed stretched underneath it, how it was not the Camino. I wouldn’t trade it, but I also think of that moment in the fog with Won Gyu, of meeting Daya as we packed for the morning, of the three German women at the pass, of the group of us wandering the dark corridors with Father Valentine. 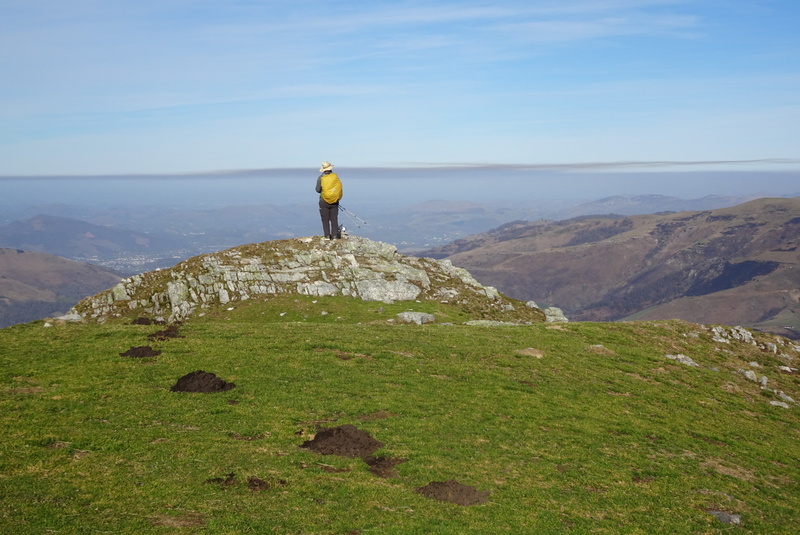 The Camino cannot compete with ridges and mountain tops. That isn’t its beauty. It is made of people and weave it makes of our paths, an invisible fabric as beautiful as any sunset. Posted in Europe North to SouthTagged buen Camino, Camino de Santiago, ENS, Europe North to South, featured, Roncesvalles, SpainBookmark the permalink. Superb! Beautiful way to start my day and appreciate life even more. So happy to see that you are in Spain, but I couldn’t let the comment pass about possibly not seeing mountains again in Spain without saying something! If you stay on the Camino, no, you won’t see high mountains. You’ll miss the Picos de Europa north of the Camino (stunning in Asturias). There are a number of smaller ranges all over Spain (including the Guadarrama between Segovia and Madrid and Los Gredos west of Madrid in Ávila), and don’t forget the (original) Sierra Nevada in Granada (Andalucía). ¡Vaya! Oh Daniel, you captured it perfectly! I am glad that you took to the mountains. I think you have some of this Colorado blood in you. The tapestry of people and connections…we must all remember that each moment! Hi Daniel! Incredible that you cross the Spanish border two days before I do it the other way. I wouldn’t have bet a dollar on it when we met 8 month ago in Kunes, Norway, both of us heading south but me on my bicycle. Well, I guess I can only wish you a buen camino! Thank you for the Buen Camino! It does feel like so long ago when we passed in Kunes! That day remains one of the best moments of my trip. This part made me smile: “to make my own decision about what is possible. I have a good eye for that.If I didn’t I would be long dead.” Um, maybe. Or maybe the gods just really really like you…because I feel like i’ve heard more than a couple stories about close calls, including with some certain very dear friends of ours up a little mountain called Whitney. Still, all that said, Daya will learn. I’d follow you up the mountain any day! You know those books you read that you just can’t put down until you finish because they’re so good? That’s my feeling about this post.